Lentils are a healthy staple of the vegetarian diet, and a cheap, versatile protein source for anyone—meat-free or not. They cook up quickly and add hearty body to a simple soup. 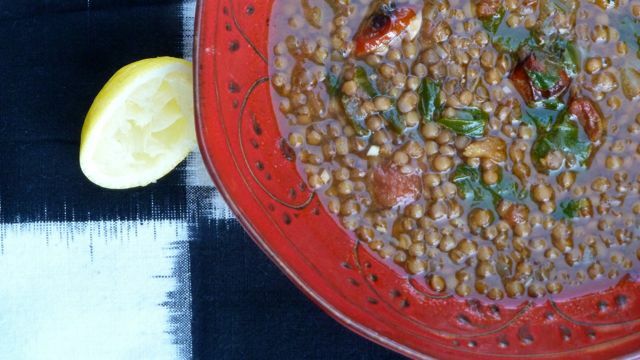 I like Umbrian lentils from Italy—they hold their shape well with cooking—but any brown lentil will do. The flavor of this soup is amped up with a pint of roasted cherry tomatoes. You could toss most any leafy green into the pot—kale, collards, mustard greens, chard. Substantial leaves will need a bit more simmering to soften. Try some chopped fresh herbs for serving—especially cilantro or mint. And a last minute drizzle of fruity olive oil. This is nothing more comforting on a rainy, mid-February Monday than a bowl of steamy Minestrone. It’s the vegetarian’s chicken soup. From the cook’s perspective this soup is made for a kitchen clean-out. You can vary the ingredient list depending on what you fine languishing in the crisper: kale, cabbage, chard, parsnips, turnips, celery root — you name it, practically anything will land happily in the pot. This recipe traces roots in many directions: the Boston-style baked beans of my youth (who knows how that got imbedded in my mid-western heritage); Southern slow-braised greens and black-eyed peas; and spicy Indian stews are among the inspirational muses. The sauce has a mildly spicy, sweet-sour tang that permeates the creamy beans. Collards are the perfect leaf for this dish since their substance loves a slow braise — they don’t go all mushy on you, but hold their character even as they become tender. Café Gratitude is a natural foods restaurant with locations in San Francisco and Berkeley. 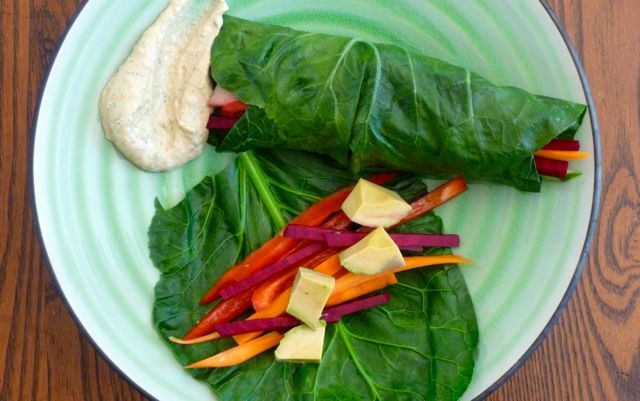 A favorite dish is their collard-wrapped summer rolls. This is my approximation. You can improvise the fillings—mix and match as you like. Choose raw items that offer a range of textures, with plenty of crunch. Kids will enjoy wrapping their own green bundles. By the way, the dipping sauce makes a great sandwich or veggie burger spread, too. For dipping sauce, blend first 8 ingredients (up to collards) together in a food processor until very smooth. Taste, then add the agave/honey if you like a hint of sweetness. Refrigerate. This step can be done a day or two ahead of time. Steam collard leaves until dark green and just pliable (less than one minute). Rinse under cool water and pat dry with a clean kitchen towel. Lay a leaf out on a cutting board. Place a small amount of julienned fruits and vegetables or other ingredients on each leaf. Roll up to create a fat cigar-like shape. Repeat with each leaf. Serve with dipping sauce. Best eaten shortly after assembly.